The story goes that at one time, Dave managed a Pizza Hut franchise. When the delivery truck failed to show up, he improvised to create his own delicious crispy crust and pizza sauce. Lately I decided it was time to try a new BBQ place here in the Kansas City area, just to see what kind of job they’re doing cooking up “The Other White Meat”. The problem is that the list of places I haven’t been to has become much shorter than the list of places I have been to. 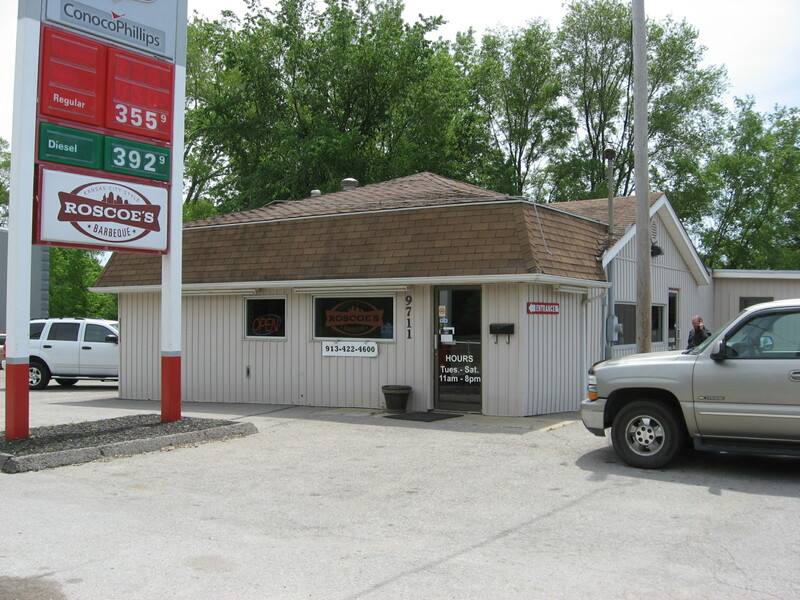 After some thought however, I finally settled on trying a relatively new place up in Edwardsville, KS, called “Roscoe’s Barbeque” at 9711 Kaw Drive Edwardsville, KS. I’d been by the place several times and there were always cars there, and the few things I read online said it was good, so I thought I’d give it a shot. My judgment from my first visit is that this place is pretty good. I had a one meat (pulled pork) dinner and had 2 ribs added to the dinner. The rib meat pulled right off the bones, as clean as can be, but the meat itself was not overcooked, and the leanness of the rib meat was just about right! The pulled pork reminded me of something done at home in the back yard, but in a good kind of way! You can tell Roscoe knows what he’s doing when it comes to cooking up a pig! It was done right I thought, as it was tender but not mushy. 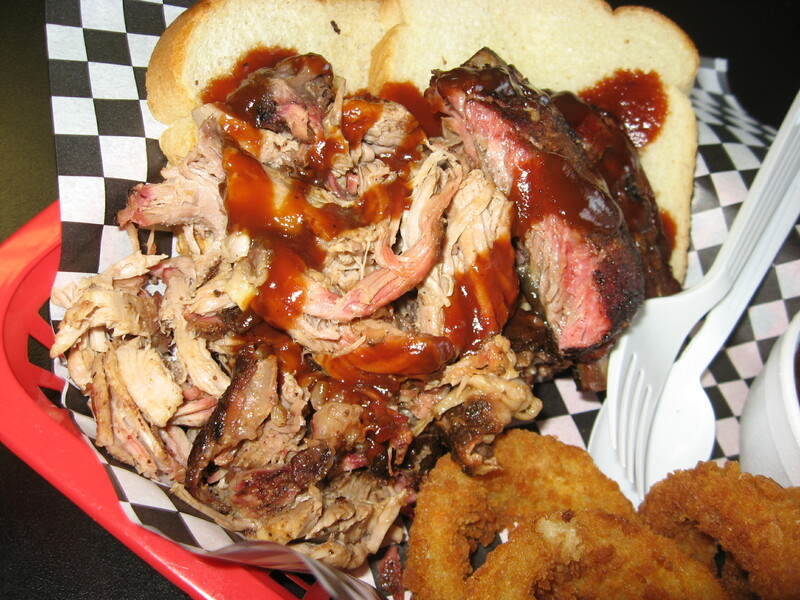 I could have gone for a smokier flavor to it, but it was still very good pulled pork to say the least. My sides were really good too, and the sauce, I thought, was of good quality. Roscoe’s, like any good Kansas City BBQ eatery ought to be, is not a fancy place. You order at the counter and sit down and wait for your food to come out. Filling your drink up and getting refills is up to you, and there is simply a roll of paper towels and a bottle of sauce on each table. Like I said, it’s how BBQ is supposed to be eaten! 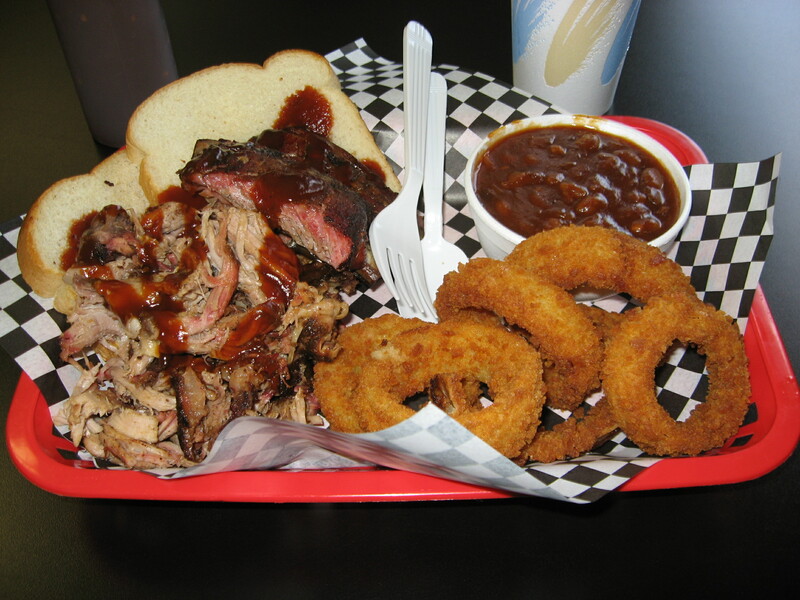 In an article that was written by one of the local papers when Roscoe’s first opened in 2009, it said that Roscoe Davis, the owner, was laid off from his job in the printing industry, so he turned to cooking barbeque to make a living. While the poor economy that cost him his old job still hangs over our heads in 2012, one can see that every cloud really does have a silver lining. In this case, it just turns out to be a slow-cooked, tasty silver lining that pairs really well with a little BBQ sauce!